For Valentine's Day I'm making some fun stuff for my lover. My kids are pretty spoiled and usually get all the surprises, but I like to focus more on my husband for the 14th of February each year. 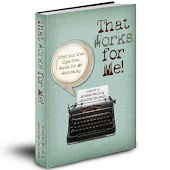 Chris is an avid reader of my blog (love that!) but I made him cross-his-heart-and-hope-to-die that he wouldn't read this post. 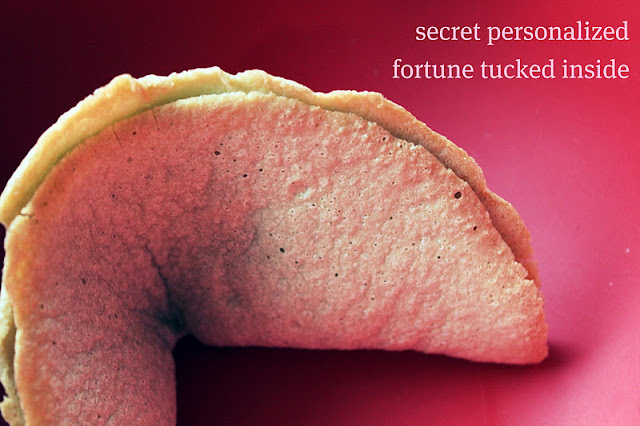 I recently discovered super cool GIANT-sized fortune cookies that can be ordered online. A few day ago, I actually ordered and shipped some to loved ones because I was crazy about them. Later that night while I was in bed I thought to myself, "Self! You can totally make those!". 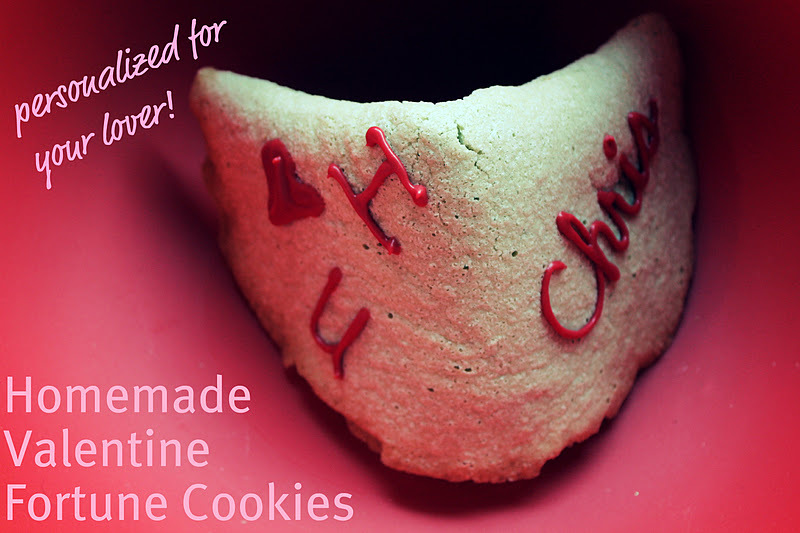 So the next morning I woke up and decided to make some for Christopher! 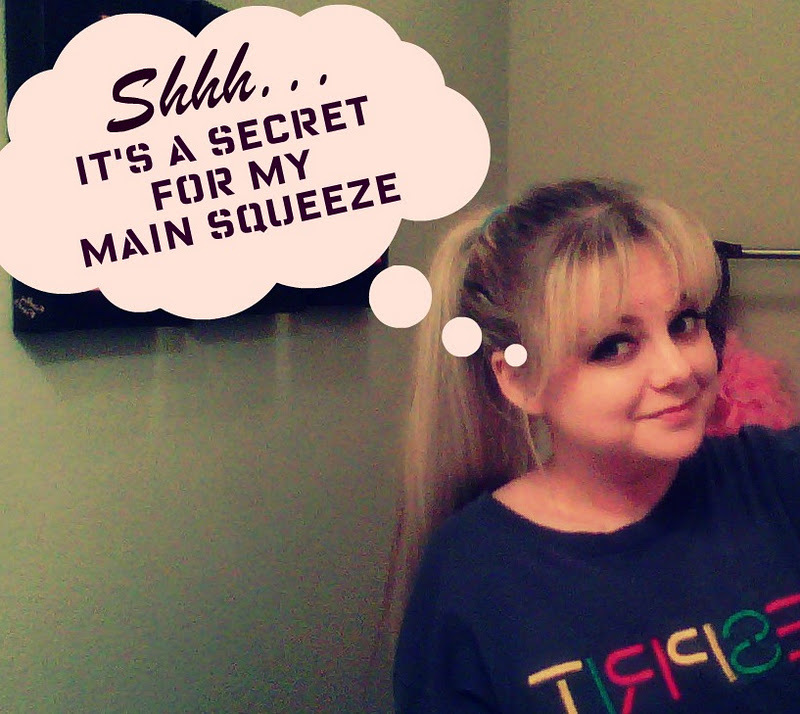 See the secret fortune hidden inside? 2) Next I found a solid recipe for homemade fortune cookies and followed it precisely. I don't have any photos of the preparation because everything moves very fast so the fortunes could get folded in before the cookies set and harden. 4) Instead of making many normal sized cookies as in the recipe above, I made GIANT cookies. My husband supersizes everything so he needed GIANT fortune cookies! To make giant cookies simply pour the batter into the middle of a cookie sheet and rotate the sheet until the batter is about 6-8 inches in circumference. 5) Once the cookies are complete, let set, dry, harden, and cool for a few hours or overnight. 6) Decorate your finished cookies! You could dip the edges in caramel or chocolate and dip in sprinkles. Or what I did was melt candy coating and put it in a pastry bag. 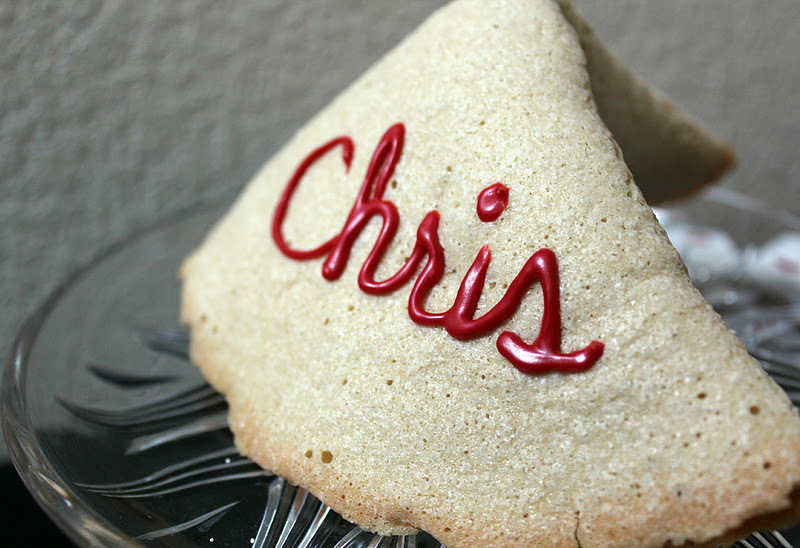 I then piped on shapes and words onto the cookie to customize it. If you're like me, you'll realize it's quite entertaining (housewives are easily amused) to make different shapes with the leftover red candy coating. 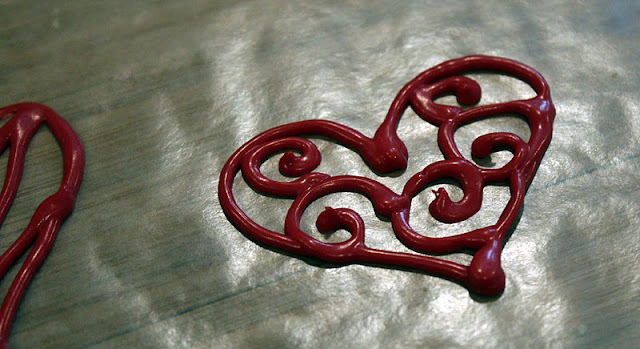 I've actually showed ideas on how to use abstract melted chocolate shapes before on a previous Valentine Day dessert post HERE. Okay, back to topic. The finished GIANT fortune cookies! To give you an idea just how big these are, I put one on a stack of love books. Each cookies is about 4-6 inches long. It adds intrigue to have secret, hidden messages folded inside a classic fun food. Discovering and reading our fortunes have always been one of those few-second delights that we get to experience in life. Meaningless, light fun that glitter our days. Love and relationships are kindled by wonder, mystery, and dreams for the future. 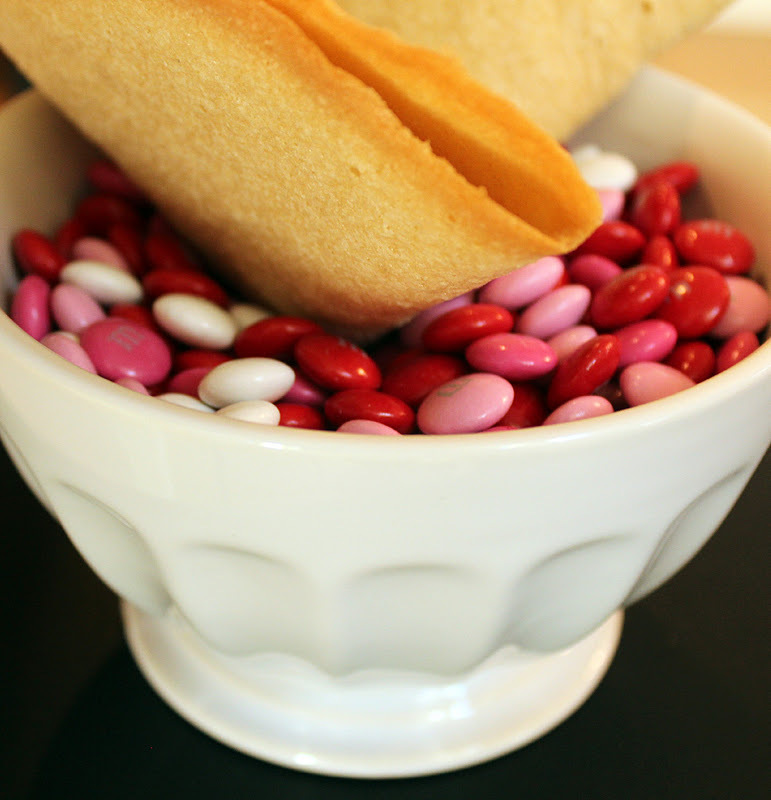 Fortune cookies are the perfect fit. can't get enough of him. What a great surprise your husband is in for! This is a great idea, Lisa. How creative of you to make these up. They've got to taste good, too. I know he's gonna LOVE these!!! 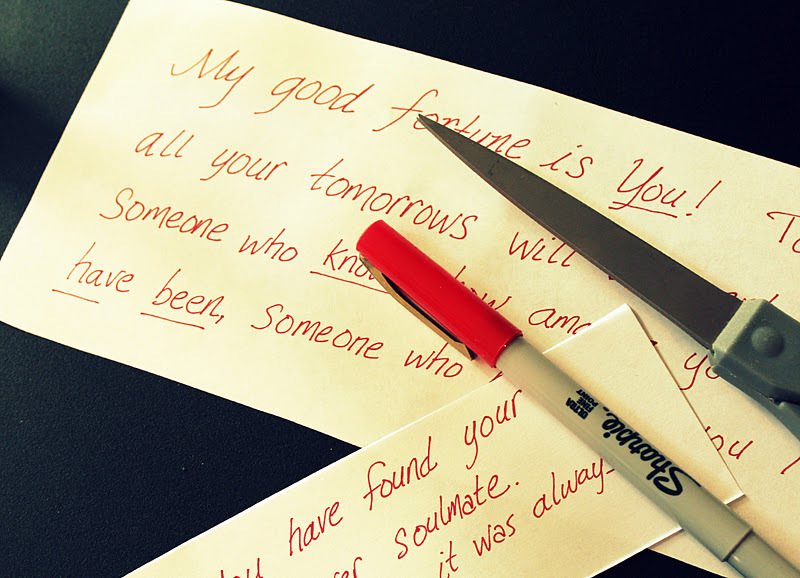 I don't think I told you, but I made homemade fortune cookies before with my own personalized messages too. I made regular size, not these cute giant ones though! This is awesome - am do going to do this!! 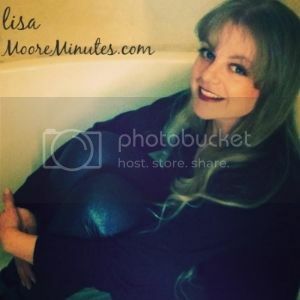 These are incredible, Lisa! 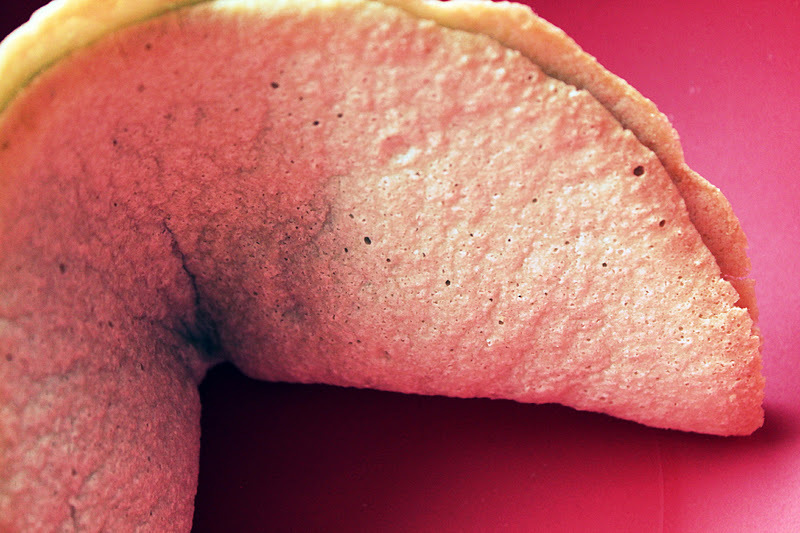 I made fortune cookies a long time ago and I remember the race to get the fortune inside and get it folded before it got hard. But SO fun! Cute idea. 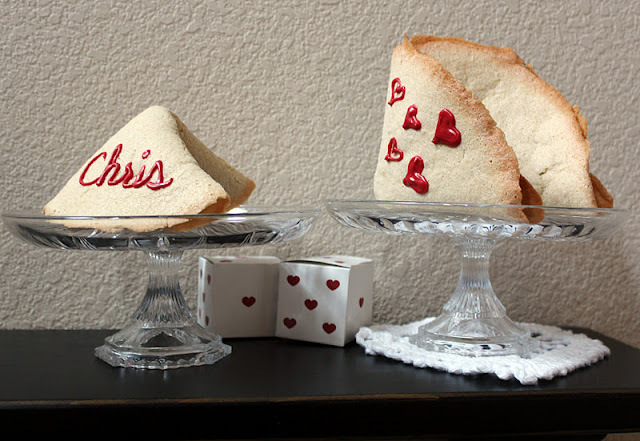 I've made fortune cookies a few times but never thought of making giant ones - great job. best thing i've seen all morning! wish i could do this, but i am a no go with anything baking/cooking. These are so cute and thoughtful. What fun! Do they taste as good as they look? These are awesome :D Very cute for Valentine's Day! Love it! 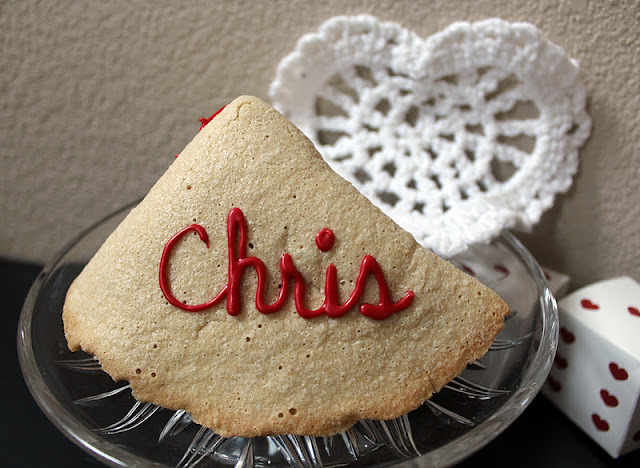 What a great way to personalize a valentines day treat. so fun, we used to make twill cookies like this in culinary school and would burn our little fingers LOL. Yours look so cute, I would never have thought of decorating them like that, I must try! Cute, cute, cute! I made these a couple years ago and they were a big hit. I'm sure he'll love it! Your photography is just gorgeous! I love the hearts you added! Stopping by from TT&J. WOW! That is SO cool! I'll have to remember this for our anniversary sometime; my hubs proposed using a fortune cookie that had "will you marry me" inside. Thanks for the great idea! Would you pretty please share it here too? I love this! 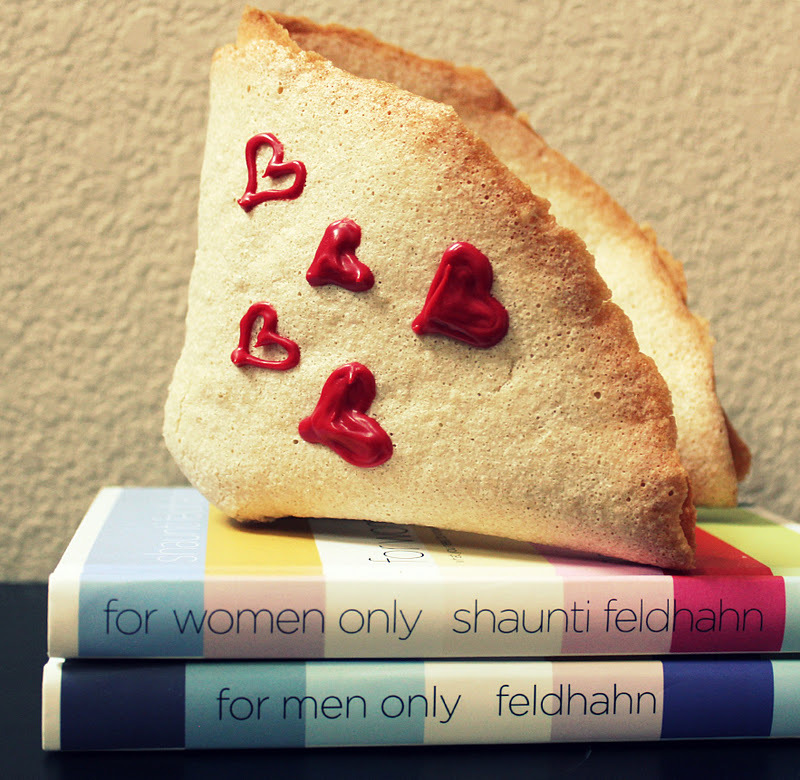 How fun would it be to crack that open on Valentine's Day! I would love if you would link up to my Friday party! These are a darling idea. 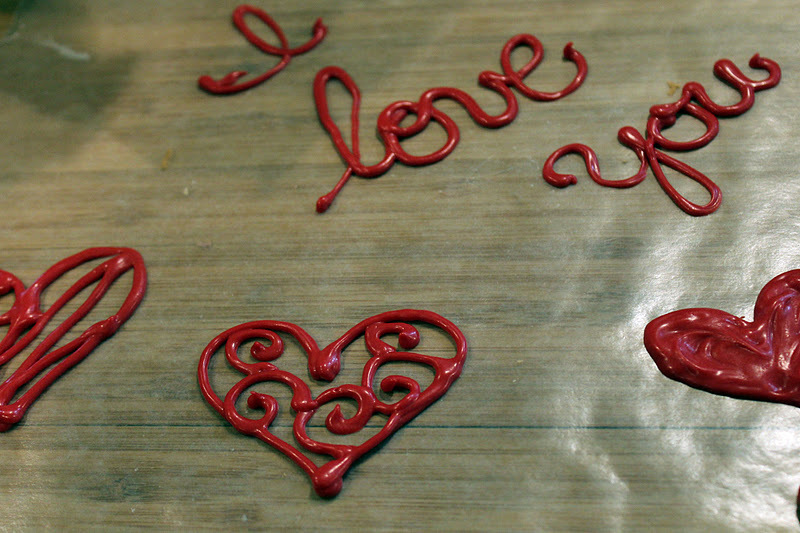 How clever of you to figure out how to make them yourself. Too cute! Those are awesome! My kids would love them! Thank you for sharing! It was awesome idea.Thanx to share with us.It really special things for the husband.I really enjoy it and i inspire from it. Such a sweet idea! Thanks for including your recipe! I love it! I made fortune cookies for New Year's Eve, and tried to fill them with snarky or funny fortunes. Everyone got a kick out of it. 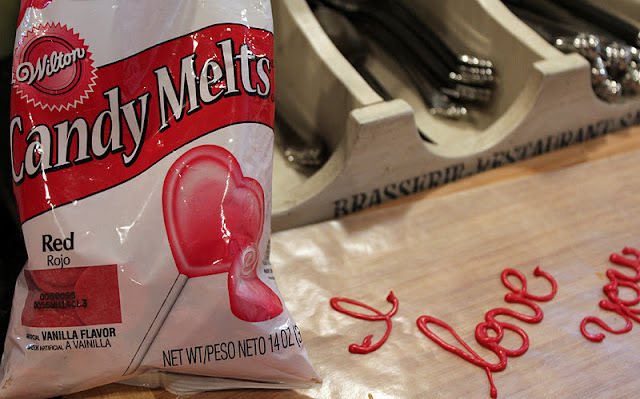 Love the Candy Melt details, too! 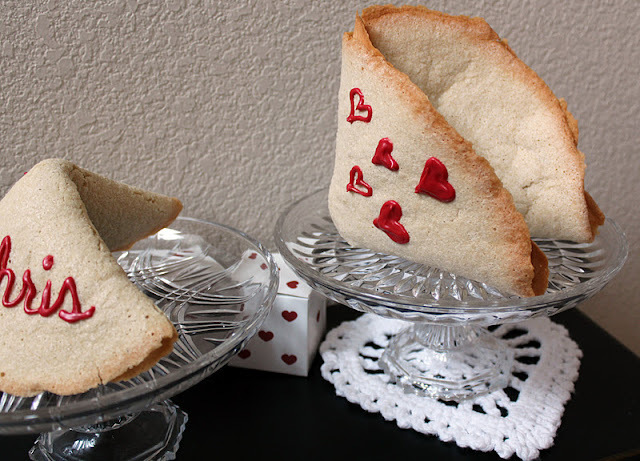 Love these giant fortune cookies! 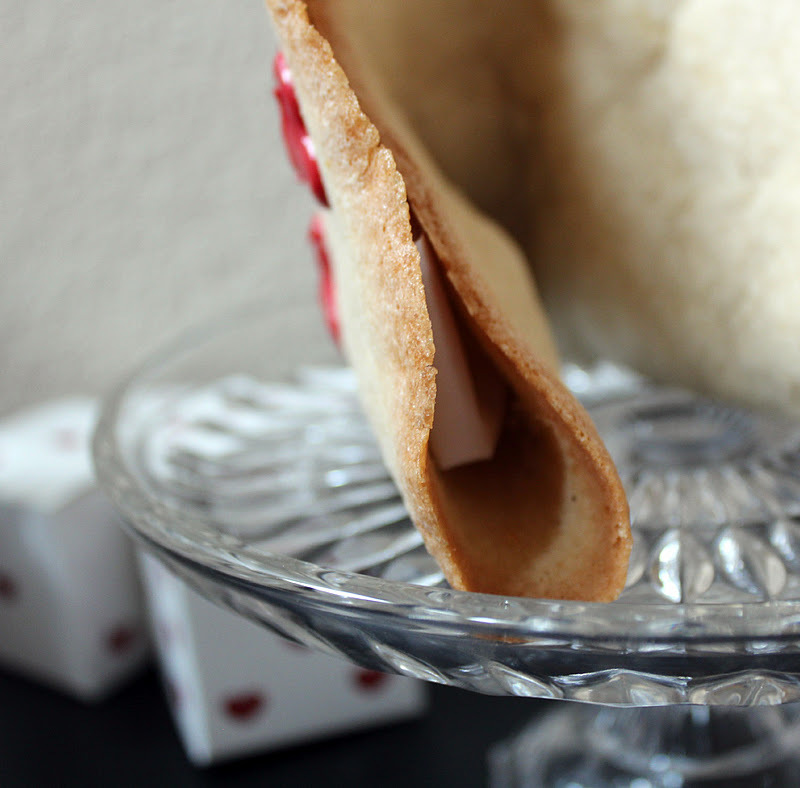 There is nothing better than a homemade fortune cookie....except a big old one with sweet messages inside. CUTE! 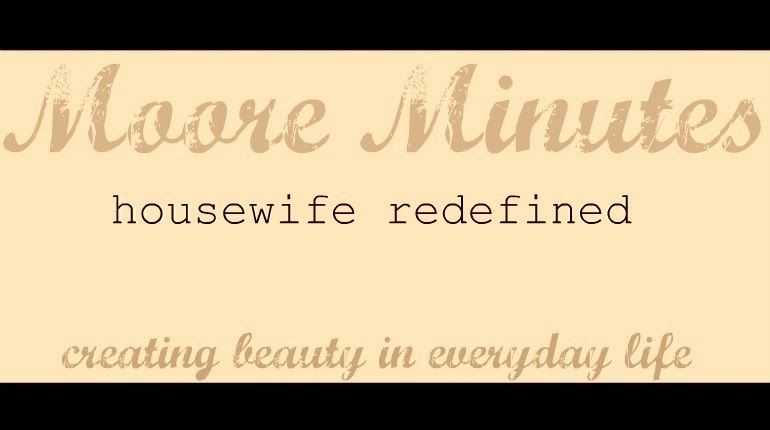 Featuring it on Tickled Pink! What fun! Do they taste as good as they look?" "Lucky in love, that's my fortune." Hey, that describes me perfectly. I feel so, so, so lucky to have you, Lisa Renee! The cookies were a complete surprise. It was hard not to visit Mooreminutes, but the wait was well worth it. It was the perfect surprise having you show up at my office, with giant, love filled treats! You and Kotah have convinced me that all cookies should be giant sized.